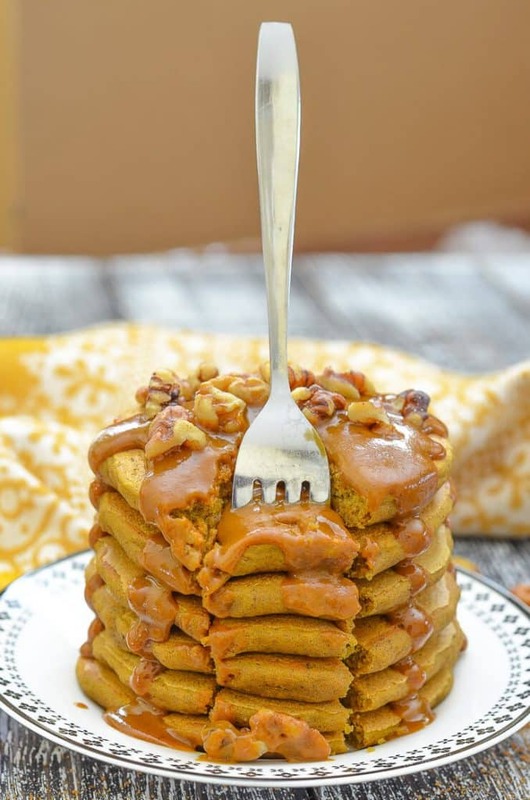 Behold these fluffy, golden pancakes in all of their whole-grain, vegetable containing, coconut sugar, spiced glory…….Yes my friends, these are Vegan Sweet Potato Pancakes drizzled in THE most delicious Caramel Sauce. 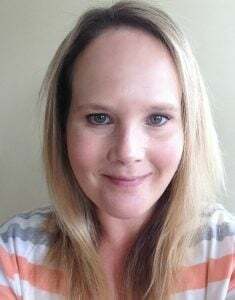 These amazing Vegan Sweet Potato Pancakes are brought to you thanks to Lantic-Rogers who are kindly sponsoring this post…. Who doesn’t love pancakes? Breakfast, brunch or dbrinner……Whatever the time of day, pancakes are just perfect, even more so when they have hidden veggies in them! Coconut sugar is my sweetener of choice in both the Vegan Sweet Potato Pancakes and the caramel sauce. 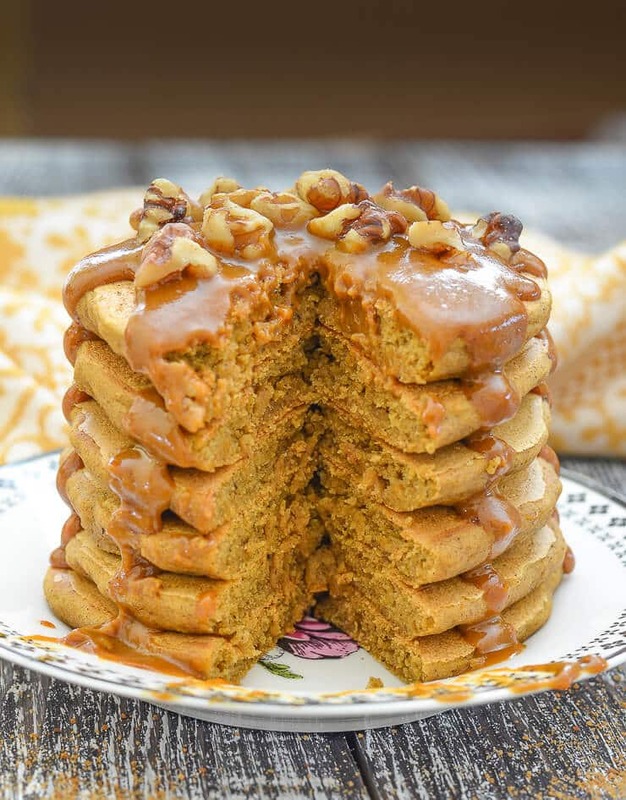 It’s rich, deep, caramel flavour works so beautifully with the sweet potato and the whole-grain spelt flour plus it makes a fantastic base for the caramel sauce. It also happens to be my favourite variety of sugar. I could literally eat it by spoon from the bag given half the chance, so when I was offered the opportunity to work with Lantic-Rogers newest nature-inspired sweetener solutions I didn’t need any persuading. Lantic-Rogers Coconut Sugar is produced from the sweet sap of tropical coconut blossoms and was recently voted Product of the Year in Canada’s Consumer Survey of Innovation. It is 100% natural and does not contain any artificial flavours or preservatives, plus it is organically grown and sustainably farmed which is important to me where sugar is concerned. 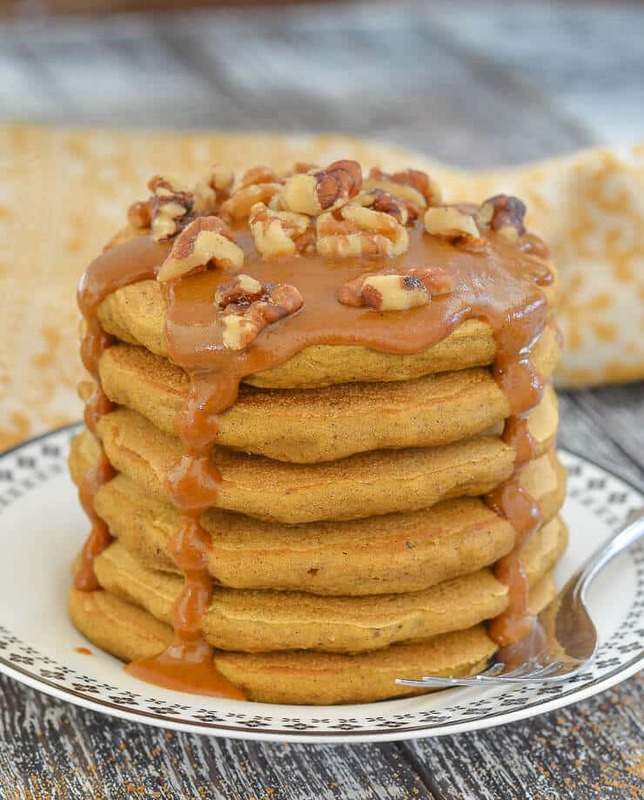 It is the perfect sugar to use in these Vegan Sweet Potato Pancakes. Lantic-Rogers other brand new addition is a Smart Sweetener Blend Sugar + Stevia. It is twice as sweet as sugar so you don’t need as much, thus reducing calories, and it can be used in just the same way that regular sugar can be, including in baked goods. So far I have been using it to sweeten my oatmeal in the mornings. Just a teaspoon of it is enough in each bowl and it has no artificial Stevia type taste like some brands I have tried in the past. I am looking forward to experimenting with it some more. These pancakes aren’t complicated to make at all. There is just the extra step of blending the sweet potato into the milk that makes them different from regular pancakes. That takes all of an extra 2 seconds, so no hardship at all. Like all pancakes the dry ingredients are placed in a bowl, the wet in another, then they are combined. It is really important to only just mix. Don’t go mad and blend it all together or beat it like mad. When you mix too well, it activates the gluten and you will end up with not so fluffy and light pancakes. The trick is to mix until the flour is just combined and you can’t see any dry bits. Then stop, and lay down that spoon. Pancake perfection is imminent! The accompanying sauce is a modified version of my Five Minute Vegan Caramel Sauce and takes quite literally 5 minutes, probably less. Both the pancakes and the sauce are flavoured with sweet potato, and either cinnamon or Jamaican Allspice. I started making them with cinnamon and it works beautifully, but then during my trials I ran out and replaced it with Jamaican All Spice. 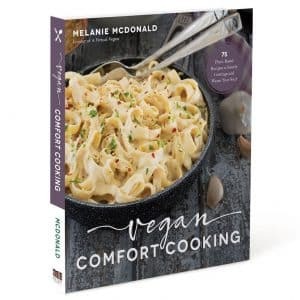 Both work extremely well and can be used interchangeably in this recipe. 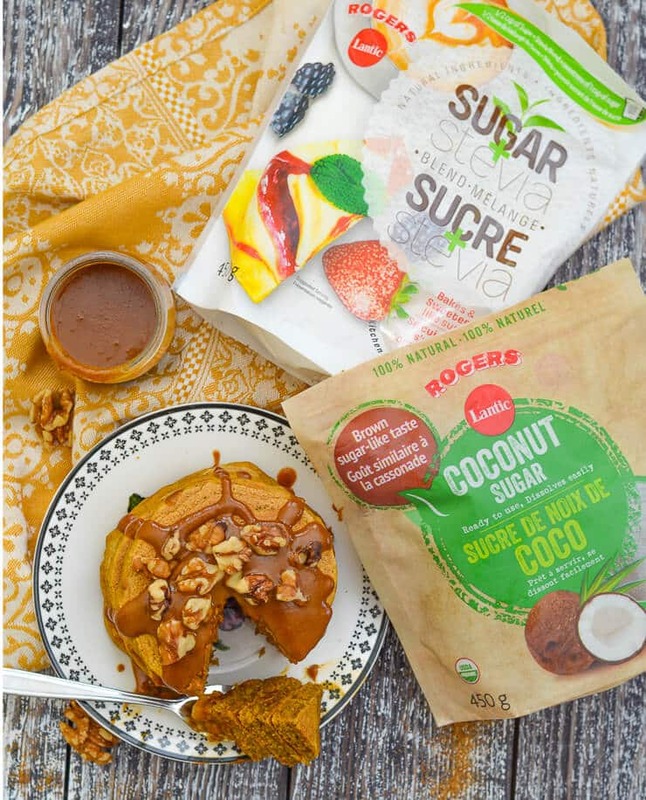 If you feel the need to run out and buy some Lantic-Roger’s Organic Coconut Sugar or Smart Sweetener Blend, it is available at Loblaw’s stores across Canada. Here is a link to a coupon valid against your purchase, and be sure to visit Lantic-Roger’s website for more great recipes. Once you have tried these pancakes, please let me know what you think. Comment below, rate the recipe and share your pics on Instagram. I love to see them! I am @avirtualvegan. 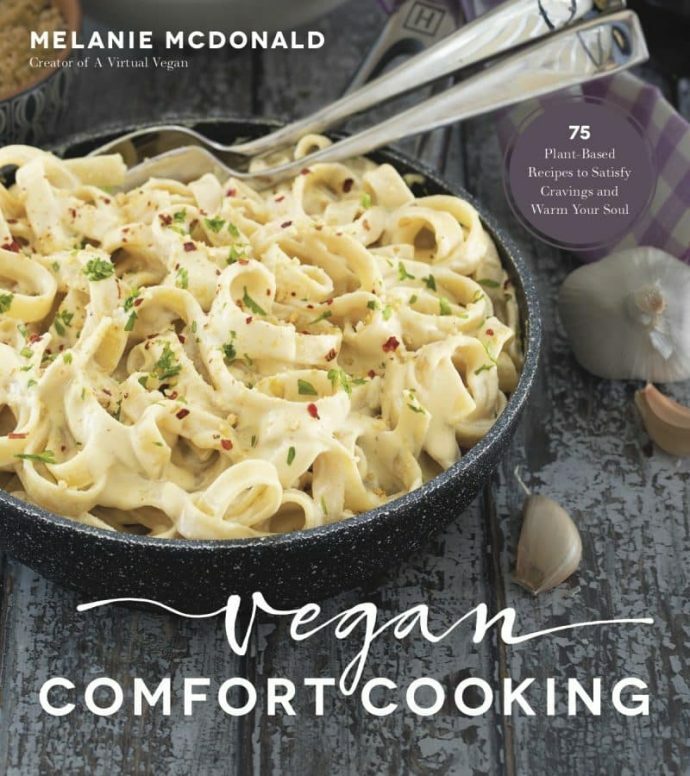 Use the #avirtualvegan if you can. ¼ teaspoon ground cinnamon , or Jamaican Allspice (use whatever you put in the pancake batter). Add the flour, coconut sugar, baking powder, baking soda, salt and cinnamon to a bowl and stir together well. Add the milk, water, sweet potato, butter, flax, vinegar and vanilla extract to a blender and blend until completely smooth. Mix the blended liquid with the dry ingredients gently, and do not over mix. Just stir it together until you cannot see any dry flour. Do not beat it or use the blender. As soon as everything is incorporated, stop and set aside. Leave to rest for 5 - 10 minutes. Heat your griddle or a heavy bottomed fry pan over a medium heat (I set my griddle to 375°F). Make the caramel sauce while the batter rests. In a small sauce pan add the coconut sugar and water and heat over a medium heat until it is liquid and you cannot see any grains of sugar. Remove from the heat. Rinse your blender out and add the sweet potato, cashew butter, salt, ¼ cup milk and the cinnamon. Pour in the melted sugar mixture and blend everything up until smooth. Add extra milk to thin to desired consistency. Return to the pan and warm gently for a few minutes before serving with the pancakes. Check the griddle/pan is hot, then scoop ¼ cup (around 60ml) amounts of batter on to it. Leave well alone until the edges are looking firm and the top is either starting to bubble a little or beginning to solidify (they don't always bubble). It takes about 5 minutes. Flip then cook for another 4 minutes. Serve immediately drizzled with the warm caramel sauce. Great served as they are but also lovely with a sprinkling of walnuts or pecans. Sliced banana also goes extremely well with them as does vanilla ice-cream if you are serving them for dessert. This is a sponsored conversation written by me on behalf of Lantic-Rogers. I only ever recommend products that I truly enjoy & use myself & the featured recipe, opinions & text are all my own. I tried this recipe this past weekend after trying to figure out what to do with my sweet potatoes and the pancakes turned out very well. It was a lot more ingredients than I usually use, but worth it for something different. I would make them again. I had no idea what to expect in terms of flavor, and I gotta admit it took some getting used to these flavors in pancakes, but once I did, it loved it!! Really something else! These pancakes are amazing! I didn’t make the sauce because I don’t do nut butter, but the pancakes alone with some ghee and applesauce and fig juice were delicious. These are a keeper! Is there a gluten free flour I could use? I have never tried them with gluten-free flour. Oat flour would probably work but you would need to adjust the liquid slightly as it’s not as absorbent as spelt. Just add enough to make it a really thick batter, almost like cake batter and it should be fine. Thank you for sharing this recipe!!! It’s amazingly yummy!!!! The best pancake so far… vegan or non- vegan! That’s so good to hear. Thank you! Tried these this morning for breakfast! Sooooo good! Pretty sure I’d be tempted to eat my own arm with that caramel sauce slathered on it!! Ha ha! I know the feeling. It’s good on so many things! I’m so pleased you enjoyed the pancakes. This is a pretty old recipe. I’ve started to do more progress shots now. To be honest with you, I can’t even remember what the batter was like, it was so long ago. With pancakes though, the thickness of the batter is pretty flexible. The thicker the batter the fatter and fluffier the pancakes will be. They will be fine. You can add a little more milk if you like to thin it out a bit. The thinner the batter the thinner and less fluffy the pancakes. I do prefer thicker batters when making American style fluffy pancakes. As an aside though, did you weigh your flour? If you used cups it could be that you’ve unintentionally used a little too much flour. Literally every-time you fill a cup there is a different weight of flour in it. It’s impossible to be accurate with them. That’s why I’m always wittering on about buying digital kitchen scales! Finger crossed you were happy with them regardless anyway! I am in love with these pancakes, and that’s without the sauce! I eat them with maple syrup or cold with cashew butter and honey. YUM!! I’ve made them with an almond- flour based GF flour mix and those were great too! I don’t think I’ll have any reason to make any other kind of pancake. Thank you for creating a perfect pancake recipe! I am wondering if it would be okay to use amaranth or quinoa instead of the spelt flour? I’m trying to avoid wheat, oats, rice, and corn. I haven’t tried it myself, but if you do I would love to hear how it turns out! 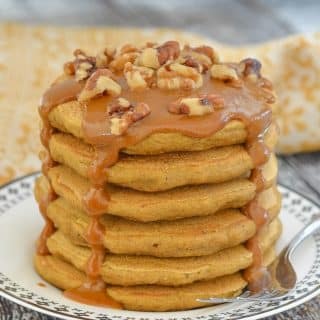 Really great recipe for anyone who loves American-style pancakes, autumn-inspired flavours and is looking for vegan breakfast ideas! Took me about an hour to make (must be my cooking abilities!!) and I burned the first few pancakes (try cooking them for a shorter time than suggested to avoid this) but after that it was all worth it! Absolutely delicious. They turned out perfect. Such a great recipe. Thank you! You are killin’ me. This is absolutely amazing from the pancakes to the sauce. Thank you so much Ginny! ???? They turned out so perfect, Mel! Well worth all the hard work. I want to dive head first into that caramel sauce! Thanks Jenn! They were worth the effort and yes that caramel sauce is very dive-in-able! OMG! I’m putting this on my list for Thanksgiving breakfast ideas. YUM! These look delicious. Just one question (it may be a silly one) but is the sweet potato cooked or raw when you put it in the blender? Can’t wait to try them! Not silly at all! I wrote ‘cooked’ on the sauce part but missed it on the pancake part. I just amended it. It is cooked sweet potato. I hope you enjoy them! also = these pancakes! yum! definitely making these soon! Love putting caramel sauce on pancakes! SO good. Sweet potatoes are such a great ingredient too and so versatile for so many things. Yum! Thanks Sophia. Sweet potatoes are the best…(as is caramel sauce ;O) ! These look amazing! 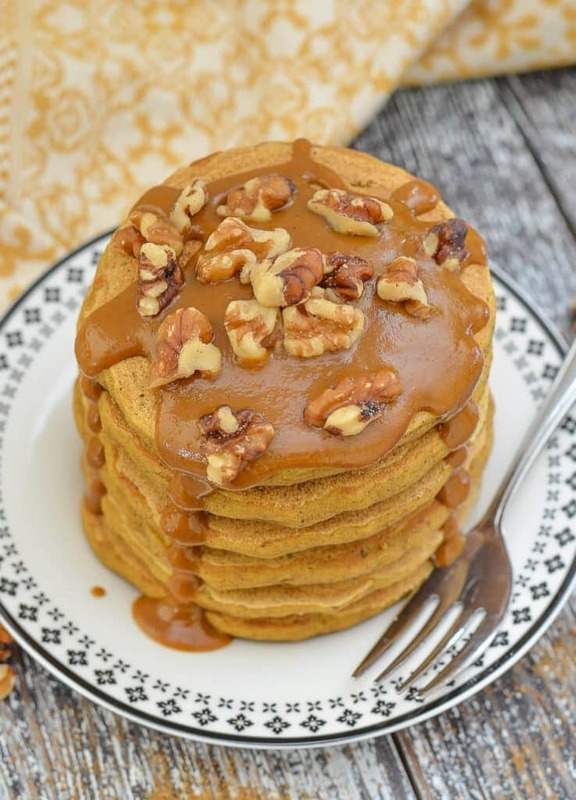 I’ve never had sweet potato pancakes before, but I know I’m going to like them, especially with that caramel sauce! Thank you Amy. Let me know what you think if you give them a try! These look so perfect for weekend brunch! I love that they’re made with sweet potatoes! Wow, these look phenomenal! Loving that caramel sauce especially.